anybody here remember interplay? probably not, they went belly up some time ago. which is surprising, because you’d think i, by my self, could have supported them into eternity. specifically, two cute little games called Realms of the Haunting and Stonekeep (neither one of which looks very good at all by today’s standards, and both of which are actually quite long) were my two favorites. looking at the installation guides is seriously a nerd’s comedy club. RotH says it requires a 486 processor. Stonekeep gives instructions on how to start the program with DOS commands. of course my other favorite old school game, Septerra Core (which interplay turns out to have had it’s hand in as well, coincidentally) isn’t much better. 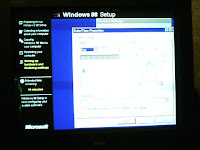 at least win 98 was out by then, but still, the Recommended System has 32 MG of ram and a pentium 233. hell, my gateway that i bought in 1999 has a pentium 500.
actually, the process went rather well. it brought back all sorts of memories. 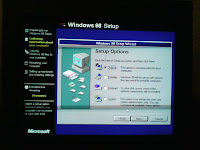 i haven’t reinstalled any version of windows since XP came out, let alone 98. i got it up and running with remarkably little fuss. finding drivers has been a bit of a chore, especially for my 3dfx voodoo video card (that’s right, it’s so old, it doesn’t even have a number), but at least it’s do-able (hint for the weary? plug the serial number into google). 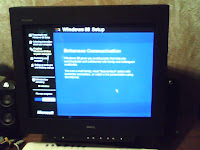 suprisingly, finding a driver for my garage-sale-find monitor (which is a 19″ dell charmer, by the by) was easy as pie. lexar even has a 98 driver for my firefly flash drive. how cool is that! … how nerdy am i!